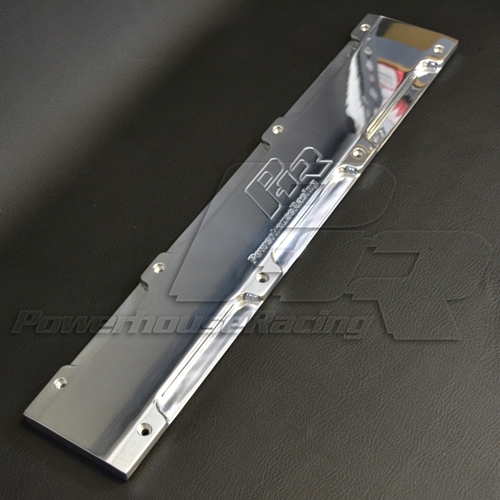 This solid billet aluminum valve cover is fully CNC machined and hand polished to a mirror finish perfect for any show! Leaves the cam gears uncovered for a more race appearance while covering up the coilpacks at the same time. Engraved with the Powerhouse Racing logo, or also available blank with no logo for a show appearance, please choose desired option below! If showing the stock cam gears are to much then we can get anything polished. Those are very nice I would suggest making them vented to aid in coil cooling. They are vented. Look closely, you'll see the vents, but it's hard to see at the angle in the picture. The vents run in between the bolt holes, which is why there are 6 recesses. In that case. BITCHIN! I'd be interested in a raw one. I'd have it powder coated to match the rest of the motor anyway. PM a price please.